This Derek Jeter patch card has been on eBay for almost 10 days and ends in a little less than 24 hours (at the time of the post). The card is up to $33. I had to edit my mistakes. However, I still do wonder if this card is real or not. I contacted Gellman and he thought this could be a fake. I also contacted Upper Deck, but have not heard back from them about the card. Are you sure it's a piece of an inaugural season new Yankee Stadium patch? Maybe it's from a final season old Yankee Stadium patch. 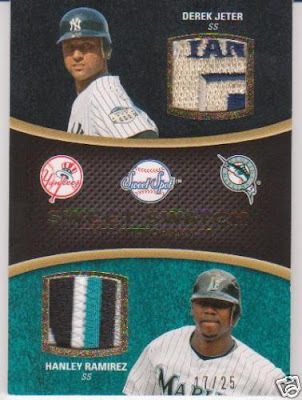 Though I don't see why a card company couldn't get a piece of a 2009 jersey in a 2009 product. Topps manages to produce cards with All-Star event-worn jerseys for the update set every year. Not that I have any idea whether this particular card is legitimate or not. you're right. That is the 2008 patch. I just looked them up. Checking it out with a sports logo/patch site, it definitely is from 2008 Yankee Stadium - the final season patch. My question is if it's real or if it's a patch card faker taking a replica patch and inserting it into the card - assuming a replica patch was made available for sale that season. It's more than likely legit. A scan of the back would probably tell the tale. UD has been including much better patches in their products over the past two years. If its fake, the back would probably be damaged where the patch was pushed in to fit in the spot. At this point, unless it can conclusively be called a fake, most would consider it real, but the suspicion may kill the value of the legitimate card making the card less valuable. Kind of ironic that a nice patch actually makes the card less valuable.